​The recent debate on the use of black face paint in morris has been at times lively and at others acrimonious, as is often the case in debates that largely come down to subjective value judgements. However, there is a place for objective fact and information to the extent that it can illuminate debate and support judgements, even though it cannot resolve such a debate in a meaningful way. One of my main motivations for running a second Morris Census in 2017 was to gather more detailed information on what face paint and/or disguise morris sides use, what changes they have made recently and what has motivated them to make those changes. ​I have not presented the arguments on either side of the debate as they are available elsewhere, but I present the data from the most recent survey to provide a description of how sides' use of face paint and disguise is changing. Around one in five (21 per cent) of sides in the UK use some kind of face paint or disguise and four in five do not. Among sides that do, a quarter (25 per cent) use full black face paint. This implies that only one side in every twenty (5 per cent) in the UK in 2017 uses full black face paint. This equates to just 40 sides. It is important to note how few sides the debate over the use of full black face paint affects. Use of face paint and disguise is rare among most types of side, and concentrated among Border, Molly and Mumming sides. Around one in ten sides within each of these three styles uses full black face paint and around one in five use either full black face paint, partial black face paint or black 'smudges'. Among sides who use face paint or disguise, the most common form used is a combination of black and coloured face paint. ​What changes have sides made? The debate about sides using full black face paint has prompted many sides to discuss and re-examine their use of face paint and disguise, and many sides have decided to change what they use regularly as a result of those discussions. The Morris Census survey aimed to capture what changes sides had made to the type of face paint/ disguise they use (if any). Given that most public debate on the issue has been in the past couple of years, asking what changes sides had made over the last five years seemed the most appropriate timescale. 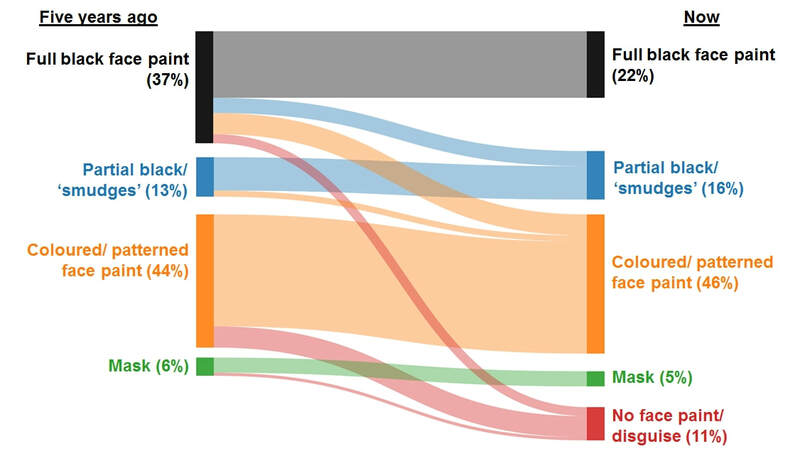 The results of that analysis are presented below in the form of a Sankey diagram. Sankey diagrams are flow diagrams, which present changes over time ('before' on the left, and 'after' on the right), where the width of the flows represents the number of sides making a particular change. The data shows that the biggest change has been the proportion of sides who use full black face paint (as a proportion of those who use any form of face paint or disguise) falling from 37 per cent five years ago to 22 per cent now. Sides that formerly used full black face paint have typically changed to either partial black face paint/ 'smudges' or coloured/ patterned face paint. A small number have changed to not using any face paint or disguise. While several sides have made other changes, the overall proportions of sides using partial black, coloured face paint and masks are largely unchanged. Why have sides made these changes? Public perceptions - some sides had discussed the "possible offence people might take to the black face paint" and the "perception of full face blacking & its (possible) racial connotations". This reasoning for making a change has been the main argument made by those in the debate who would like to see sides use alternatives to full black face paint. External guidance - several sides specifically mentioned the influence of the Morris Federation's Guidelines to teams using face paint as a disguise on their decision to change. The guidelines had been issued in response the public debate about the issue, and outlined the legal advice that the Morris Federation had been given and considerations that sides might wish to make. Some sides referred to the guidelines as having prompted change (“[changed] because of concern expressed by Morris Fed”), while among others the guidelines had reinforced the views they had come to ("We changed it recently, before the Morris Fed recommended the change… With the Morris Fed recommendations, all of our side have now changed"). Reluctant pressure - some sides mentioned the pressure they felt to make a change, which was implied to be a reluctant change ("PC pressure"). Other sides implied that the decisions their side had made collectively had not be agreed unanimously: "We decided that [black face paint] wasn't worth the hassle, although not all the side were happy about the decision all have agreed to go along with it". Practical reasons - some sides had reasons for making changes that were unrelated to the wider debate on the matter of full black face paint, citing practical reasons to be their main motivation for changing. Some mentioned the practicalities for side members ("bad skin, stains shirt, cannot be bothered to put it on"), while others mentioned the outward-facing impact of their particular face paint on the audience ("Pattern was too difficult to successfully reproduce and was not obvious to audience what it was").